A solid and dependable choice for battle on the field. The height-adjustable Yamaha Tough Terrain Frame is built to support Yamaha's YM-2400 Marimba on and off the field. 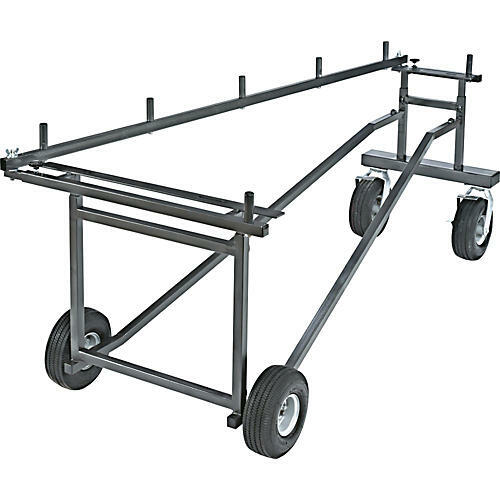 The Tough-Terrain Frame has welded steel construction and the carrier's 10" pneumatic tires protect your marimba from the rigors of transport. The wheeled marimba frame's minimal number of adjustments eliminates loosening and subsequent loss of parts. The Yamaha carrier frame has 2 lower crossbars that protect your marimba's resonators from damage, and a removable accessory bar that accommodates all parallel multi-clamps on the market, as well as all Yamaha rack clamps. The Yamaha Tough-Terrain Marimba Frame promotes proper playing technique and comfort, due to its adjustable height, and sturdy design.